Wind streaks occur in several places on Mars, although the most prominent and best known are found in Syrtis Major Planum. Streaks form when wind and dust interact with hardened, resistant surface features, such as hills and especially raised crater rims. When the wind encounters a raised feature such as a crater rim, the feature deflects the wind, causing the air to spiral as it flows beyond the feature. Scientists call the spiraling air a vortex. 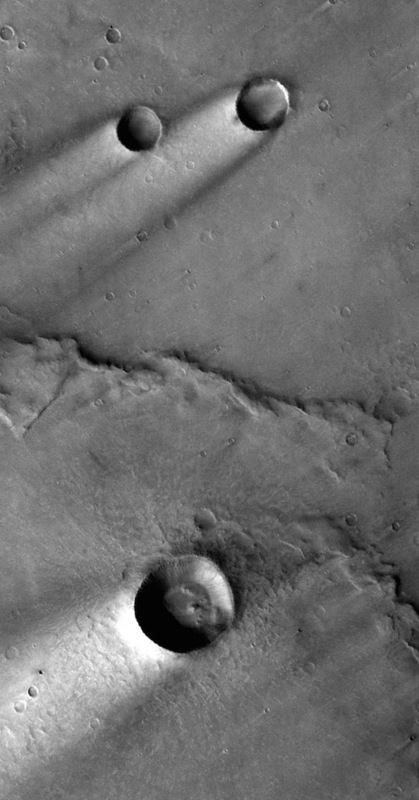 Behind a crater, for example — in the lee of its rim — the vortex can scour away bright surface dust exposing the dark rock surface called dark wind streaks. In some cases, the vortex can also redeposit the dust in the center of the lee. This produces a streak with darker edges flanking a brighter interior called bright wind streaks. Wind streaks also give scientists direct information about wind direction. The "tail" of the streak always points in the opposite direction or away from where the wind is originating almost creating an arrow pointing the direction the wind was traveling.